The Klein Oak HS Mariachi Band - a student run organization, mind you - played in a concert with the KO Jazz Band last night, and I was fortunate enough to attend both, since Bailey plays with the Mariachi Band. The concert was outstanding. The Jazz Band played a half-dozen terrific pieces, I was amazed at the talent and the obvious hard work of these student musicians. Since Bailey plays with the Mariachi Band, on a lark I videoed the two pieces with my new phone, and uploaded those to my You Tube channel. Those two videos are below. I think they were terrific. It was a lot of fun watching them play. Wow. John Bailey Needham turned sixteen yesterday. Naturally, that means it is time to post some new images. Here he is at sixteen. I stiched a few images together to post to FB so here are those now too. Finally, this last image - Carolyn made her chocolate chip cheesecake with caramel topping. This was at the request of the birthday boy. Bay had a good day. But us, his parents, wow. We could not be more proud of the young man that Bailey has become, and continues to grow into. Last Friday night they had a three hour practice, followed by 8+ hours on Saturday. Aftter just that practice, the band had a concert last Saturday night. I'm not sure I can adequately express how proud we were of Bailey - and of his bandmates here. They learned these five songs in just a few hours of practice, then played a concert at Klein Forest High School. The band performed under the direction of Richard Floyd, in his 53rd year of music direction, and who is currently the director of the Austin Symphonic Band. The 2016 Region Band (Region 9) Wind Ensemble, conducted by Richard Floyd. "This Broad Earth" by Steven Bryant. Performed December 10, 2016 at Klein Forest High School. The 2016 Region Band (Region 9) Wind Ensemble, conducted by Richard Floyd. This is comments by the conductor Richard Floyd. Performed December 10, 2016 at Klein Forest High School. The 2016 Region Band (Region 9) Wind Ensemble, conducted by Richard Floyd. "Sleep" by Eric Whitacre. Performed December 10, 2016 at Klein Forest High School. Then the band played Dancing on Water, by Frank Ticheli (8:57). This was a piece Bailey really enjoyed learning and playing. The 2016 Region Band (Region 9) Wind Ensemble, conducted by Richard Floyd. "Dancing on Water" by Frank Ticheli. Performed December 10, 2016 at Klein Forest High School. The 2016 Region Band (Region 9) Wind Ensemble, conducted by Richard Floyd. "The Bernstein Set" Bernstein/Krance & Bernstein/Sweeney. Performed December 10, 2016 at Klein Forest High School. The 2016 Region Band (Region 9) Wind Ensemble, conducted by Richard Floyd. "Zing" by Scott McAllister. Performed December 10, 2016 at Klein Forest High School. I shared this over the weekend, but for the sake of posterity: Bailey played trumpet in the Texas Region 9 band auditions on Saturday. He advanced. Definitely worth noting that the top-two trumpeters in Region 9 are from the same school as Bailey. We've said all along that the kids here are getting an exceptional education, especially a fine arts education, at Klein Oak. This is further evidence of that. Mr. Clearwater and his team? Really outstanding. For Klein Oak (HS) band, Bailey had to record the three etudes that were used to judge the auditions. Since he had to do that anyway, I figured it would be worth it to preserve them on You Tube. So, below, here are the three etudes, as performed by Bailey. He did great. We hope everyone had a terrific Thanksgiving. We certainly did. We are very fortunate, and we know that. We're grateful for everything we have. We had two turkeys yesterday, had some great friends over, and ate more than anyone really should. Now, with Thanksgiving behind us, we look forward to the rest of 2016, and we look forward to whatever 2017 will bring us. ....plus a few others from yesterday. I am just practicing with my big lens. Rose The Hound laying in the dirt. One of Carolyn's succulents in a pot. First day of sophomore year, for Bailey. 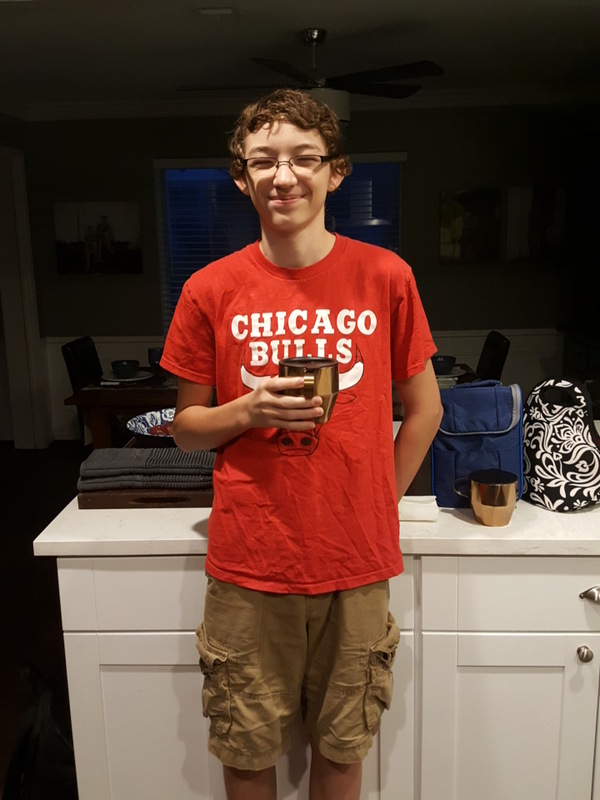 First day of high school, for Cody. Both sporting their Chicago sports affiliations. We're pretty proud about that. And here are some pictures of our dogs.